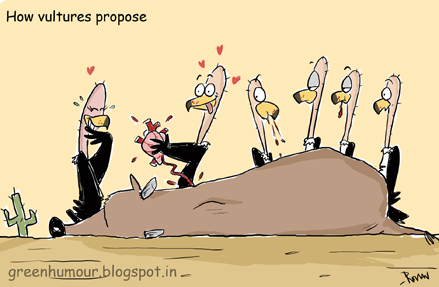 Nature's ultimate janitors, vultures are capable of stripping a carcass clean off meat in just a few hours. Their sharp, hooked mandibles pierce through the toughest kinds of meat efficiently and their bald heads prevents any dbris from sticking on. Globally, vultures today are one of the most endangered group of birds, with population declines on about 50% in Central Africa and more than 90 % in India owing to the poisoning of carcasses and the use of Diclofenac Sodium, a banned anti-inlfammatory drug used for treating cattle.